New Delhi: The Minister for Science & Technology Dr. Harsh Vardhan has said that the Prime Minister has a lot of confidence in the youth to give the country a great advantage now. Speaking after presenting the Meritorious Invention Awards of National Research Development Corporation(NRDC) in New Delhi today, he said that in this context the Prime Minister looks forward for a new India by 2022. The Minister said that due to demographic dividend of the country, the next 5-10 years are expected to be a kind of golden era for the country. He urged all to move with a great self-confidence and zeal to achieve the glory that is due for India. He said that there is a need for greater innovation in institutes like NRDC. Secretary, DSIR and DG, CSIR Dr. Girish Sahni, said that the NRDC with its good track record should further forge ahead to be a leader for taking the technology to the people particularly that which do not have sufficient financial support. The National Research Development Corporation (An Enterprise of DSIR, Ministry of Science and Tech., Govt. 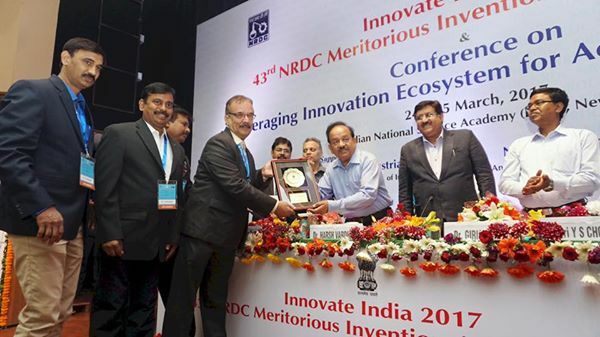 of India) was organising its 43rd NRDC Meritorious Invention Awards Ceremony & Conference on “Leveraging Innovation Ecosystem for Accelerating Startups”. The aim of the event is to encourage the inventiveness and inculcate the spirit of invention in the country by giving them awards for meritorious activities in various fields. Various stakeholders, including governments and the scientific and academic communities, were present on this occasion.